The Phagwah Parade in Richmond Hill, Queens, is the biggest celebration in North America. In 2019 it will be held on Sunday, March 31, 2019. Phagwah is the celebration of Holi, a Hindu festival. Indo-Caribbeans immigrants from Guyana and Trinidad brought the celebration to Queens, starting the parade in 1990. It's a typical community parade. Floats carry beauty pageant winners, businessmen, and religious and political leaders down Liberty Avenue and over to Smokey Oval Park, where there's a concert. After 9/11 some feared that the Phagwah celebrations, especially with the powder, could become a target for terror. Thankfully, the parade has never been disturbed. It has always been a safe, fun day. The only problem is for those who want to keep their clothes clean. Even if you stand back on the sidewalk, it's common to get dye splattered on your clothes. And if you step into the street, you are fair game for the kids with super-soakers full of purple dye. No one must throw any abrac or powder on Police Officers. 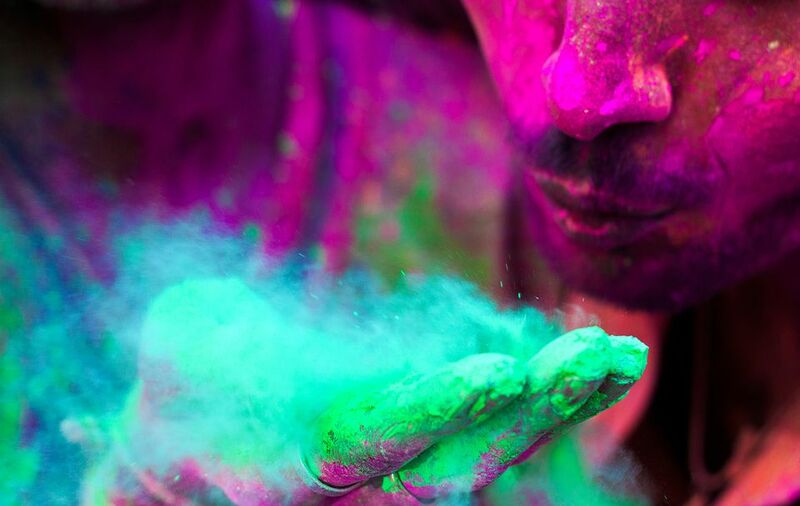 Phagwah (also spelled Phagwa) is the Indo-Caribbean celebration of the Hindu spring holiday known as Holi in India. It is the traditional Hindu festival of spring and the new year of its lunar calendar. For thousands of years in India, Hindus have celebrated Holi as the victory of good over evil, and as the renewal of the agricultural seasons. (Its fall twin in the Hindu year is Diwali, the Festival of Lights.) Local celebrations vary, and always color plays a big role. Indians who went to the Caribbean as indentured laborers in the 19th century and early 20th century brought the holiday to Guyana, Surinam, and Trinidad. The holiday flourished and gained the name Phagwah. In Guyana and Suriname, Phagwah became an important national holiday, and everyone had the day off from work. Since the 1970s many Guyanese have emigrated to the United States, especially to Richmond Hill and Jamaica in Queens, and brought the Phagwah tradition to their new home. The Rajkumari Cultural Center (718-805-8068) is a Richmond Hill community organization dedicated to teaching and preserving Indo-Caribbean art and culture in NYC.